Information regarding imprinting and personalizing items. We can imprint names on scriptures, hymnals, and most hardbound journals. We do not imprint on scripture covers and totes. 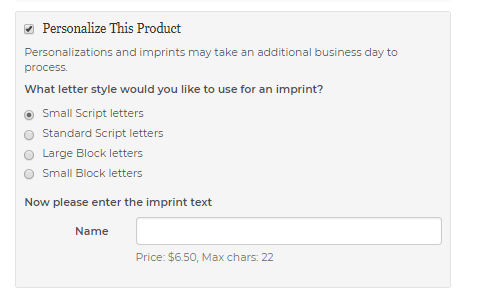 There can be one line of text and the cost of imprinting is $6.50 per book and this will be added to the price of the item you wish to have imprinted. Items eligible for imprinting will have a check box where you can mark to request an imprint. Once this box is marked you will have a space available to enter the name as well as select the style. Imprinting is available in either Script (upper & lower case letters) or Block (all upper case letters) and is available in Gold. Please do not exceed 22 letters including spaces. We do not have symbols, punctuation, or special characters including accent marks, quotations, dashes, or parentheses. We are unable to imprint more than one line on an item. Imprint requests may delay the processing of your order by 1-3 days.